The Qualifying Rounds of the Virtual Majors Begin Now! 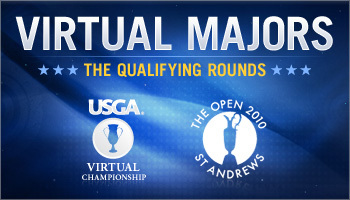 The Virtual Majors kick off an exciting phase today with the stroke play Qualifying Rounds of both The USGA Virtual Championship at Oakmont Country Club and The Virtual Open Championship 2010 on the Old Course at St Andrews. Additional events include new Back 9 Closest-to-the-Hole Challenges on both courses. Prizes worth thousands of dollars and experiences money can't buy are up for grabs! From now until July 11, compete on all 18 holes of Oakmont from the championship tees in the The USGA Virtual Championship Qualifying round. It’s unlimited play and your best scores will automatically post to the leaderboard. 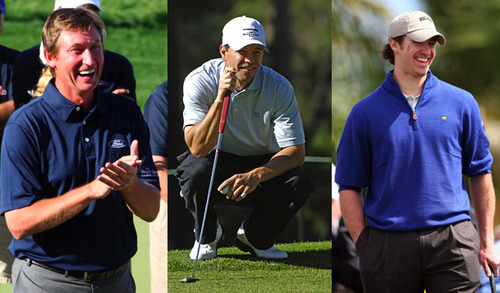 The top 156 players plus ties will make the cut to compete in the 36-hole Championship. Those who qualify for the Championship will not only win a 1-year membership to the USGA, but will also have the the opportunity to compete in the Championship round with a grand prize trip for two to the 2011 U.S. Open at Congressional as a guest of the USGA. Anyone who posts an 18-hole score will also be entered into a sweepstakes drawing with a chance to win a $500 gift card to the USGA online store. From now until July 18, compete from the championship tees on all 18 holes of the Old Course at St Andrews in the Qualifying round of the The Virtual Open Championship 2010. The top 156 players plus ties will make the cut and play in the 36-hole Championship to determine this year's winner. Each qualifier will win an official Open 2010 Imperial Cap and will have the opportunity to compete for the grand prize, a once-in-a-lifetime trip for two to Scotland to play golf on the Old Course. Anyone who posts an 18-hole score will have a chance to win a $500 gift card to OpenGolfShop.com via a sweepstakes drawing. Win Trip for Two to the 2011 U.S. Open at Congressional or a Golf Trip for Two to St Andrews! *Prize eligibility for each event is subject to their official rules. Be sure to read them. When you need a break from competing in the Virtual Majors, try testing your skills against those of Tiger Woods, Jack Nicklaus, Tom Watson, Ernie Els, and more! Watch official archived videos of the best shots from previous U.S. Opens at Pebble Beach, then try to hit those very same shots yourself, and see if you can beat the Pros! Just go to to USOpen.com and click on the button depicted below to experience US Open History. We have new clubs in our Pro Shop that offer increased distance and power, perfect for hitting from the Championship tees and edging out the stiff competition to make the cut in the Virtual Majors. Check them out in the Pro Shop, and compete with the latest gear. Heads up! There will be a brief 20 minute downtime window for some routine maintenance tonight, June 1, at around 11:59 PM Pacific Time. Please make sure to save your games! Did you know you have two different sets of clubs in your inventory? When you first join the game, your golf bag is automatically equipped with our Beginner clubs, which offer a slower swing meter, and are a great way to get used to playing the game. But you also have second set of clubs, the WGT Starter clubs, that offer an increase in distance and power with a slightly faster swing meter. To switch from the Beginner clubs to the Starter set, you'll need to go the the My Equipment tool within the game. To access this tool you must be logged in to the game. Click on the My Equipment option under My Settings from the Main Menu. Alternatively, you can also access My Equipment from your profile page. Once you are in the My Equipment interface you need to "click and drag" the club or ball you would like to equip from the inventory section into the In My Bag section. Make sure you click the Save Changes button. View the video below for a brief tutorial. You can also purchase more powerful and precise clubs in the Pro Shop.